Hurricane Tested Outdoor Advertising Billboards | Outdoor Specialist, Inc.
OSI Outdoor Advertising Structures Weather The Big Storms! If a picture is worth a thousand words, these are priceless. If you are an advertiser, these images should help you understand that not all billboards structures are the same. 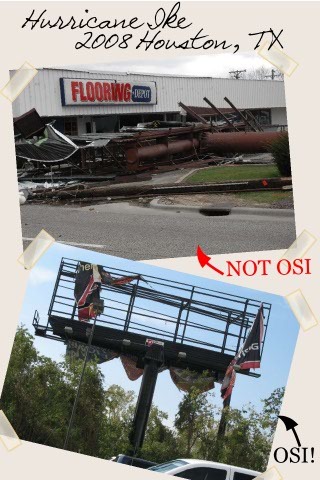 Here is the photographic proof of why you should choose OSI to build your outdoor advertising structures. Vinyl is relatively cheap and fast to replace compared to replacing a billboard. In some cases, replacing a billboard is not even an option! Changing community standard and permitting designed to reduce the amount of billboards often prevent billboards downed by storm from being replaced! If you are an outdoor advertising company, the thought of having one or more of your billboards destroyed by an act of nature conjures up nightmares. Your advertiser doesn’t care that a structure carrying his sign has been broken by an unavoidable natural disaster. All they want to know is when their advertisement will be back up. If your structures are designed, fabricated and installed by OSI, it is much more likely that your structures will be standing the day after a violent storm! If your marketing campaign demands that the the sign be upright and visible, be sure your outdoor advertising agency uses OSI-built billboard structures. Sonny Kuhn and the team at Outdoor Specialist, Inc.